The first ever international flight to land at Silangit, the gateway to Lake Toba in north Sumatra, was more than 45 minutes late. But that did not dampen the enthusiasm of the welcoming party. The 100-strong group rolled out the red carpet and brought out the drums and musicians as the Garuda Indonesia Bombardier CRJ1000 NextGen from Singapore landed in pouring rain on October 28. For the local Indonesian tourism officials it was a big occasion to receive the 55 people — mostly travel agents, journalists and photographers — who arrived on the flight. They ushered the visitors through immigration and customs at the small airport and got local beauties to garland all who arrived with intricately-stitched, colourful shawls. Goodie bags were also pressed into the visitors’ hands. The runway at Silangit is not big enough for wide-bodied jets to land. 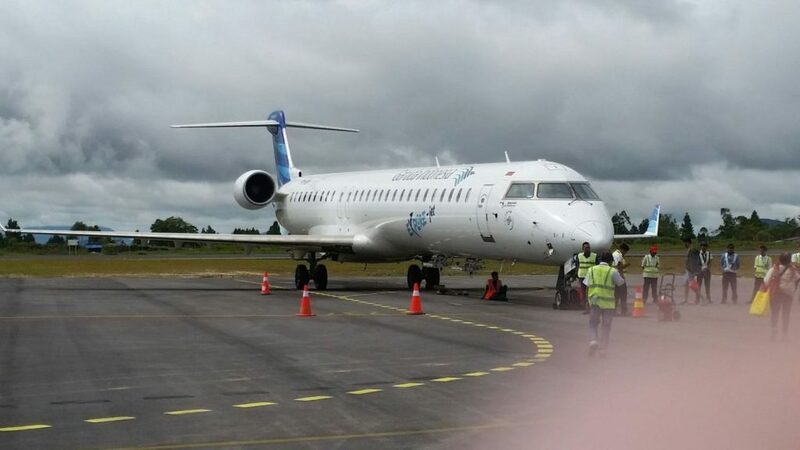 So, Garuda Indonesia used the Bomabardier, as the 96 seater is ideal to make the one-hour flight from Singapore and compact to land without a fuss at Silangit. Moreover, the local authorities were in a hurry to start promoting Lake Toba as it is one of the “10 new Balis” that President Joko Widodo wants to develop nationally. The flight departs Singapore at 1.15pm and lands at Silangit at 1.30pm (local time) three days — Tuesday, Friday and Sunday — a week. The return flight from Silangit is at 10.15am. For travellers from Singapore this is a boon, as previously they had to take a flight to Medan and then take the six-hour road trip to Lake Toba. According to Veronika, Garuda Indonesia’s marketing coordinator (Asia region), the airline has a 3D/2N package costing $299 per person for those interested in visiting Lake Toba. The 4D/3N package costs $349. More details can be got at sin-reservation@garudaindonesia.com.sg or 6250 2888.